South African Krugerrand 1 Ounce (Oz) gold bullion coin. Each of these gold coins contains one troy ounce (or 31.105 grams) of investment grade gold bullion. The history of the Krugerrand can be traced to its first release in 1967 by the Rand Refinery in South Africa. The coin was released with the purpose of aiding and growing the South African gold market. The Krugerrand’s history had been somewhat turbulent. The coin saw its greatest popularity at the end of the 1970s, when up to 3,000,000 gold Krugerrands were minted and sold annually. However, the coin was later banned in the early 1980’s. At this time, it was illegal to buy a South African Krugerrand in the United States, as South African goods were banned due to apartheid. The United States was the primary purchaser of retail gold coin in the 1980s. Krugerrand production and sales increased again after the end of apartheid, but never regained the levels of sales that they saw in the late 1970s. The Krugerrand gold coin is one of the most popular coins available today. Because of its popularity in the 1970s, it quickly became one of the most recognized investment gold coins worldwide, and that still holds true today. 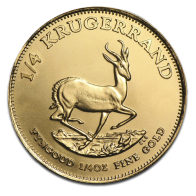 In the 1970s when the Krugerrand was so prominent, it was the only government minted 1 Ounce gold coin available to retail investors in large quantities. The Canadian Maple Leaf series was not released until 1979, and others, such as the American Eagle and the Austrian Philharmonic were not released until the mid-1980s. It is for this reason that Krugerrands are so well-recognised. 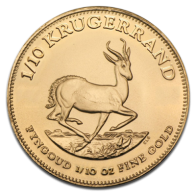 Each Krugerrand gold coin features the image of Paul Kruger on the front facing side with a Springbok antelope decorating the reverse. The Krugerrand also features ridged indentations around the outer edge of both sides of the coin. The front of the coin features the word 'South Africa' wrapped around the image of Kruger and written in both Afrikaans and English. 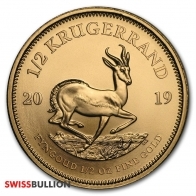 With such a low investment premium and such very fine, very high quality gold it is no wonder that the Krugerrand is one of the world's most popular god bullion coins. When you buy Krugerrands from Swiss Bullion, your gold coins will arrive sealed in a plastic slip to protect the coin. Should you wish to invest in gold Krugerrands in larger quantities, then your coins will be packaged in a plastic tube of 20 coins per tube. This helps prevent damage and scratching while your coins are en-route, and helps to protect them when in storage. 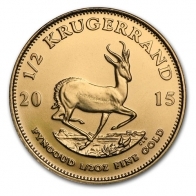 The South African Gold Krugerrand is available in gold in 1oz, ½ oz, ¼ oz and 1/10 oz sizes. In 2016 the Rand Refinery also released a silver version of this coin, and in 2017 a platinum Krugerrand was released. The silver South African Krugerrand coin was designed to compete with the silver Canadian Maple Leaf, and trades at a similar margin above the spot silver price. The Rand Refinery also produce the Loxodonta elephant gold bar series, which is available in 1oz sizes. Swiss Bullion offers all of its products for delivery or for storage in our secure Swiss vault storage, located in Zurich, Switzerland. Storage is free of charge for the first year. When items have been placed into storage, clients may select to sell their precious metals back to Swiss Bullion at favourable rates, or take delivery at any time. The gold American Eagle coin is VAT / MwsT exempt.